Wallows singers/guitarists Braeden Lemasters, Dylan Minnette, and drummer Cole Preston have been playing in groups together since they were 11, starting out at a San Fernando Valley music program, Join the Band. Nearly a decade later, the trio are about to release their major label debut on Atlantic Records, Spring, a collection of six new songs that wear their pop-rock hearts on their collective sleeves. Inspired equally by their adopted love of classic rock (Beatles, Led Zeppelin, Stones), alt/indie faves (The Strokes, Arctic Monkeys, Vampire Weekend, Arcade Fire, Kings of Leon, St. Vincent, Alvvays) and their own idiosyncratic tastes (which range from Mac DeMarco, [Sandy] Alex G and The Garden to Frank Ocean, Steve Lacy and Tyler, The Creator), Wallows’ fresh new sound revitalizes rock music for a new generation. 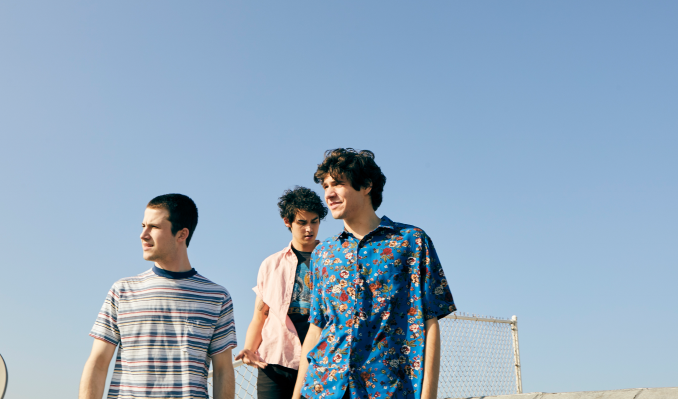 Wallows are an overnight sensation that took almost 10 years – and more than their requisite 10,000 hours – to connect with an audience. Working together as only longtime friends could, the group went through several iterations, with various degrees of success. A little over a year ago, the group – having not even decided on a new name – recorded four individual tracks with their good friend, North Dwarf Records’ Stefan Mac in his Lake Forest, CA, studio. The reaction to “Pleaser,” “Uncomfortable,” Pulling Leaves Off Trees” and “Sun Tan” was immediate – Zane Lowe debuted both “Sun Tan” and “Pulling Leaves Off Trees” on his Beats 1 Radio show; “Pleaser” picked up more than 5 million streams, landing at #2 on Spotify’s Global Viral 50 Chart and topping KROQ L.A.’s Locals Only playlist. Sold-out shows at L.A.’s The Roxy and Troubadour, San Francisco’s Slim’s and the Mercury Lounge in New York were followed by a headlining national tour that put them in the major labels’ crosshairs, ultimately signing their first recording contract with Atlantic Records. There’s a yearning and optimism in Wallows’ music that brings back some of rock’s golden eras. And while both Dylan and Braeden have their respective acting careers, music has become their top priority. And if the term “wallows” is often followed by “self-pity,” that’s not the case with the band, whose name refers to the Hawaiian skate spot made famous by the 1987 boarding documentary, The Search for Animal Chin. Braeden, Cole and Dylan have the easy-going manner of best friends; that quality comes out clearly in music that produces earworms in a single listen, and live shows boasting the kind of camaraderie and warm feelings only a lifelong bond can produce.